Could Russell Martin benefit from a few more days off? And we’re off! With the release of our catcher rankings, the 2009 RotoRob MLB Draft Kit is officially launched. Over the next few weeks, we’ll be issuing a complete set of cheat sheets with analysis, essays, columns and our destined-to-be-classic Top 10 Lists That Fantasy Owners Always Wanted But Were Afraid to Ask For. As a special treat, we’ll also be unveiling the most comprehensive keeper list ever compiled. Seriously. By the way, Brandon Inge is not listed here, but rather is on our 3B list. If he were listed here, he’d be No. 18. 1. Brian McCann, Atlanta Braves: McCann’s tremendous bounce back season in 2008 lands him in the top spot among backstops. He’s a real workhorse who hits for power and average and even added a little bit of speed to the mix last season. Oh ya, and he just turned 25 last month, meaning there’s plenty of upside. Expect to use a fifth round pick to land McCann, currently representing U.S.A. at the WBC. 2. 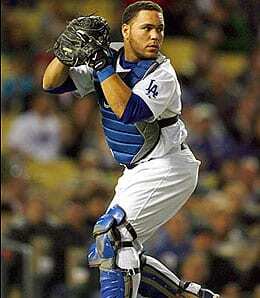 Russell Martin, Los Angeles Dodgers: Martin is another young, multi-talented catcher who sees a lot of action behind the plate. And I mean a lot. Despite making 11 appearances at third base, this Canadian kid still caught 149 games. I’m starting to wonder if the workload is getting to him (he slugged 100 points less after the break), and how big a concern this should be heading into 2009. Martin has upside, but he was unable to build on his huge sophomore campaign, although the major increase in patience bodes well for his ability to develop into a .300 hitter. 3. Joe Mauer, Minnesota Twins: Mauer, hardly the old man on the list at age 25, bounced back from an injury-plagued down season in 2007 to set career highs in runs and RBI. He did an amazing job of cutting his strikeouts, while his plate discipline went to a completely different stratosphere. As a catcher who not only helped lead one of the top offenses in the AL and who finished fourth in the AL MVP race, Mauer is a major fantasy stud, capable of vaulting back to the top of this list by season’s end. 4. Geovany Soto, Chicago Cubs: Rarely do you see a hyped rookie catcher, once handed the keys to the kingdom, who actually makes a seamless transition. Such was Soto, who combined power, patience and a fine batting average into a season worthy of earning kudos as the 2008 RotoRob Fantasy Rookie of the Year. He’s plying his trade for Puerto Rico at the WBC and then will look to build on his big freshman effort with the Cubs. 5. Victor Martinez, Cleveland Indians: How can a guy who missed half the season, was extremely unproductive, saw his power completely evaporate, experienced a decline in his strike zone judgment for the second straight season and have the dubious distinction of being our 2008 RotoRob Fantasy Flop of the Year make our top five at catcher? Simple. V-Mart was coming off a 2007 season in which he launched a career-best 25 homers and had his customary .300+ BA, so we’re willing to give him a mulligan for 2008. He’s healthy and committed to returning to the elite (as evidenced by his turning down a chance to play for Venezuela at the WBC), so don’t let Martinez fall too far off your radar on draft day. He’s an excellent candidate to win another RotoRob Award in 2009 as the Comeback Player of the Year. 6. Mike Napoli, Los Angeles Angels: Despite an increasing strikeout rate, Napoli emerged as a serious offensive threat, spanking 20 dingers as a part-time backstop. Two years ago, he was nothing more than an injury waiver wire pickup, but now Napoli is a legitimate fantasy backstop. Do note that he’s dealing with a wonky right shoulder this spring after off-season surgery, so that’s going to slow him down, at least defensively, for now. But because of his potent bat, look for him to see time at DH on occasion when he’s not behind the dish. 7. Ryan Doumit, Pittsburgh Pirates: Doumit’s power keeps developing and as he enters his prime, it’s seems reasonable to think he’s capable of clouting 20 to 25 dingers this year, assuming he remains healthy – something that hasn’t always been easy for him. Still, Doumit took a huge step forward in 2008, doing a fantastic job of making better contact. Small wonder he made our Wire Troll NL All-Wire Team. The Pirates are convinced he’s for real, committing to a long-term deal with Doumit; you should consider doing the same for your team in a keeper league. 8. Chris Iannetta, Colorado Rockies: Yet another member of our coveted Wire Troll NL All-Wire Team, Iannetta, like Napoli, showed tremendous power in a limited role. He broke through with an extremely productive season, showing fantastic on-base skills as well as power. In fact, among NL backstops who had at least 300 at bats, Iannetta ranked second in OPS. He’s arrived and is plenty young enough to improve. 9. Bengie Molina, San Francisco Giants: So what if Molina is the slowest MLB player alive, just slightly faster than Ted Williams’ frozen head? The Giants rode him last season, and he responded with personal bests in many key categories, enjoying a tremendously productive year. Molina has pretty decent pop for a catcher and his strike zone judgment bounced back after a couple down years in that regard, but I do worry about the fact that he’ll be 35 this summer, and his body doesn’t exactly scream “in it for the long haul” to me. 10. Matt Wieters, Baltimore Orioles: Because of his tremendous power/average combo, Wieters is one of the most anticipated catching prospects to come along in many years. And if you’re thinking that just because he’s a rook, you can sleep on him in your draft this spring, think again. We’ve seen him going in the 10th round, so don’t let Wieters slide. There is some question about whether he’ll be the full-time starter right from the get-go, but no one doubts that the job will be his soon. Baltimore certainly has cleared the catching decks for him, shifting 2005 first rounder Brandon Snyder to a corner infield slot (although injuries were a part of that plan, too) and shipping incumbent Ramon Hernandez to Cincy. 11. A.J. Pierzynski, Chicago White Sox: Another veteran catcher who’s getting a wee bit long in the tooth, Pierzynski still managed to impress us enough in 2008 to record his third 150-hit season. For now, he remains a productive backstop. 12. Jorge Posada, New York Yankees: Posada struggled badly last season, endured two trips to the DL and finally had his season end early thanks to shoulder surgery. He’ll slide this year as a result (you can get him in the 18th round of some drafts we’ve been involved with), but don’t sleep on him too long – reports on this Yankee leader’s shoulder have been extremely positive this spring. 13. Dioner Navarro, Tampa Bay Rays: Despite an early-season injury, Navarro set a career high in games played, responding with the finest offensive season of his career. There’s still plenty of upside here, and I could see him turning into that long-promised .300-hitting catcher, but I wonder what impact losing in arbitration to the Rays will have on the youngster. 14. Kelly Shoppach, Cleveland Indians: Pop quiz: who led all AL catchers in home runs last season? In any other season, V-Mart or Posada would be good guesses, even Hernandez. But in 2008, it was Shoppach’s 21 dingers that led the way. Cleveland’s “backup” catcher just keeps getting better and better. He’s a productive bat who made some strides in improving his patience at the plate last year. With Martinez expected to see plenty of action at first base and DH, don’t worry about Shoppach not getting enough at bats to be a very useful fantasy asset. 15. Yadier Molina, St. Louis Cardinals: One of the best defensive catchers in the biz, Molina’s offensive game has been developing nicely as well the past couple of seasons. His strike zone judgment is so strong, leading me to believe that there’s definitely room for further improvement here. In fact, I spent plenty of time last season wondering why he was so underappreciated as a fantasy asset. I still don’t have a good answer. 16. Chris Snyder, Arizona Diamondbacks: Arizona’s intense starting catcher tied his career high in games played, experiencing yet another season of offensive growth in 2008. He’s not much of a contact hitter, upping both his walk and strikeout rates – so if you’re looking for a .300 hitting catcher, Snyder’s not your man. But he’s primed for a big-time power breakout, and it wouldn’t shock me if he approached 25 home runs this year. 17. Ramon Hernandez, Cincinnati Reds: Hernandez’s power bounced back a bit last season, but don’t be looking for him to put up any more 20-dinger years, especially now that he’s in Cincy, which is actually a tougher HR park than Camden (at least in 2008). He’s been in slow decline for a couple of years, and I expect that to continue this season. Expect something to the tune of .260 with a home run total in the low teens. Honestly, Hernandez strikes me as a fantasy catcher that is very close to falling off the map. He’ll offer the Reds more offense from the catcher position than they’ve had in recent years, but that’s not saying much. 18. Jeff Clement, Seattle Mariners: He’s a tremendous power prospect, but Clement struggled to show it as a rook and clearly needs to develop a more patient approach at the plate. He’s going to get a chance to be the starting catcher, but note that Seattle is also preparing to employ him as the backup at first base and I’m not sure if that’s a good thing or not. I suppose it is as long as Clement qualifies at catcher, and the team finds ways to get him more at bats. Gauging Clement’s long-term home on the diamond, however, is trickier business. We already identified Adam Moore as a serious threat to Clement’s claim as the catcher of the future in Seattle, and that’s something to consider in a keeper league. 19. Kurt Suzuki, Oakland Athletics: Suzuki proved to be a real workhorse in his first full season in the majors, although he wasn’t able to develop his power at all. There’s still time to see if some of his doubles will turn into homers, but I have my doubts. What concerns me more was his less patient approach in 2008 – something that won’t be tolerated in Oakland. Suzuki was scorching mid-season, making for a great pickup, but he really faded down the stretch (perhaps because of the huge workload?). Suzuki’s role as the starting catcher is unchallenged for now, but 2009 could be a very important season for determining whether or not he’s a useful long-term asset. 20. Jesus Flores, Washington Nationals: Flores took over as the starting catcher, getting the bulk of the work behind the plate for the Nats last season. I’d like to him develop more patience, because as is, he could be limited from a batting average perspective. Still, there’s enough gap power, productivity and upside potential here to warrant grabbing Flores in the 20th round. 21. Gerald Laird, Detroit Tigers: Laird rebounded from an awful 2007 season, but that only added to Texas’ catching depth. The Rangers helped clear this logjam by dealing him to Detroit this offseason, and so far, the Tigers are thrilled with their acquisition. 22. John Baker, Florida Marlins: Baker came out of nowhere last season, showing pop and patience after an extremely long apprenticeship in the minors. Yes, he’s quite inexperienced, but he spent the offseason improving his ability to shut down the running game – something that will stead him well in his quest to remain a starter. 23. Ivan Rodriguez, FA: I-Rod’s power continued to decline, but at least his overall game looked like it had bounced back to an extent last season. But then, he arrived in the Big Apple and his extra-base pop completed disappeared. We thought Boston or the Mets might be interested, but neither of those options panned out. There was even word Texas wanted to bring him back (assuming it could deal away one of its trio of great young catchers), where Pudge could be a mentor and back up whoever won the starting job. But Rodriguez still wants to play five days a week, so forget about that plan. Finally, there is the ongoing rumour that Florida will bring him back, and if that happens, obviously Baker won’t be as valuable. 24. Taylor Teagarden/Jarrod Saltalamacchia, Texas Rangers: This duo earns a single entry as the winner of the job will be ranked right here. To add to the confusion, young Max Ramirez is another talented young backstop for Texas. Teagarden has played the fewest big league games, but he may very well be the best of the trio. Saltalamacchia, the youngest, has been knocking on the door for a while now, but his offensive development stalled last season. We considered him a must-own when he was recalled last season, but it didn’t work out so well for Salty. Many expect him to break camp as the starter and hold the job initially, and his big start to the spring has done nothing to alter that opinion. 25. Miguel Olivo, Kansas City Royals: Olivo was more or less in a job share with John Buck last season, but despite his low contact rates, the Dominican showed a better stick than he had in 2007 with the Fish. He got off to a strong start, making him an early-season wire target for AL-only owners, and although his BA slipped dramatically in June and July, he’s expected to be the main man behind the plate in KC this season. Do note that Buck will continue to fight Olivo for PT all season long, so this is far from a settled situation.